SiteLines offers full manufacturer-certified installation services as well as supervision services to work with your volunteers. The division of responsibility varies for each of the steps involved, but the sequence of steps remains the same. Below is a brief summary of the various phases of a standard playground installation. 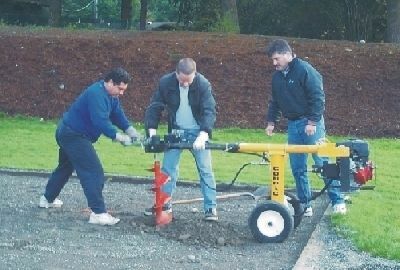 Before any playground equipment can be installed, the area must be cleared and leveled. If there are utility lines running beneath the surface, these agencies will need to be contacted in advance to insure that no damage to underground lines will occur during the digging process. The play area shown here previously featured older play equipment and pea gravel that was removed; you can see the location of the old containment border. Using the footing plans provided by GameTime, the locations of the post holes are marked on the ground using spikes and spray paint. Be sure to mark the holes far enough away from the containment border so that, once the equipment is installed, there are adequate use zones. 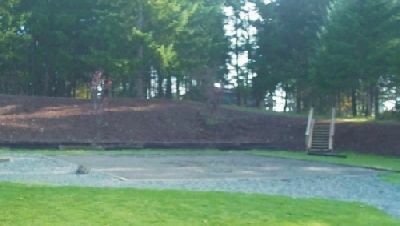 The new play equipment at this site required a larger area than the old items, so one edge of the containment border was removed. A few days prior to the equipment installation, the holes are dug to the diameters and depths specified for each individual component. Digging the day of the installation is not advised, in case there are unforeseen site problems such as hard or rocky soil, broken auger blades, etc. For large sites, an auger mounted on a Bobcat works well; for smaller sites like the one seen here, a hand-held auger is often easier to use and is less expensive to rent. Once all of the holes have been augered, they must be leveled (or sighted") using a transit---usually the first step on installation day. 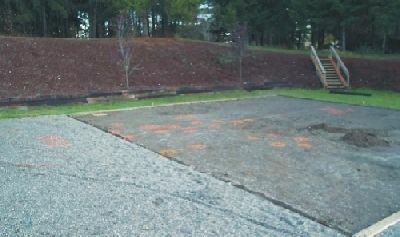 This insures that all of the holes are the same depth throughout the playground, which insures that the equipment will be level once installed. While the holes are being sighted by a few people, the remaining helpers can begin transporting and unwrapping the equipment, which is delivered prior to installation day and stored in a secure site chosen by the owner. Most pieces are wrapped in cardboard boxes or heavy-duty plastic (as shown), so you'll want to make provisions for the disposal of a sizable amount of packaging material. The plastic is #4 LPDE, which is recyclable in many communities. All of the pieces are marked with stickers for identification. Removable white stickers are on all of the decks, climbers, rails, slides, etc. ; on the upright posts, blue non-removable labels are placed near the bottom of the posts. A bold horizontal line appears at the top of the label; this shows the required finished depth of your safety surfacing once the equipment is installed. This not only assists in getting the correct depth during the initial surfacing installation, but it also lets you know at-a-glance when future top-offs are needed. Each upright is factory-drilled for the specific components that will attach to it, so each is marked with a unique six-digit number to identify its position on the structure. The vertical notch in the center of the bold line indicates the orientation of the pole once placed in the hole. Nothing made this volunteer crew happier on a cool, hazy morning than a donut and a hot cup of coffee! After the holes are leveled and all of the pieces are unwrapped, it's time to begin assembling the equipment. Starting near the center of the unit and working outward, the first decks are bolted to the upright poles. All of the components are bolted together loosely until the structure is fully assembled. All of the decks bolt directly to the pre-drilled uprights using a simple hardware connection---no fancy tools, and no need to guess where the connections go! This streamlined design makes GameTime's equipment the easiest commercial playground equipment to install, which is a big plus when working with volunteers. Once all of the equipment is assembled, all of the poles and decks are checked to insure that they are level and plumb. After any adjustments are made, the bolts are tightened down the rest of the way. Now you're ready for concrete and safety surfacing! With the concrete set, the containment border built, and the safety surfacing installed, the playground is finally finished---let the fun begin!